The fifth generation of the Moto G series (the Moto G5/G5+) and all of its variants have already received official Android 8.1 Oreo update. Today, the highly anticipated Android 8.1 Oreo OTA update is now rolling out for the Moto G4 and Moto G4 Plus. 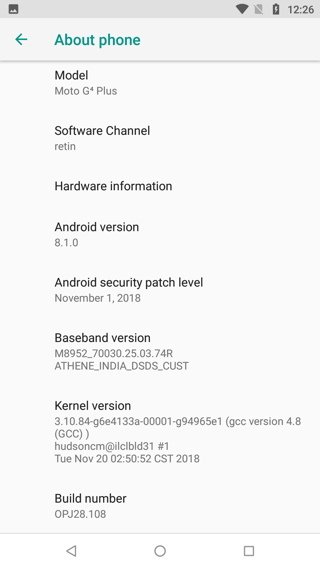 For users who have already signed up for the Motorola Feedback Network Beta program have started receiving the Oreo update on the 4th gen of G series. Thanks to users of the Moto G4 and G4+ (in source), we now have the Android 8.1 Beta OTA update available for download for all of us. The Oreo OTA for the Moto G4 (Plus) has been captured and ready to install on most of the variants. However, it is the first soak test. So it may come with some bugs. It features a new firmware build number OPJ28.128 with November 2018 Android Oreo security patch. 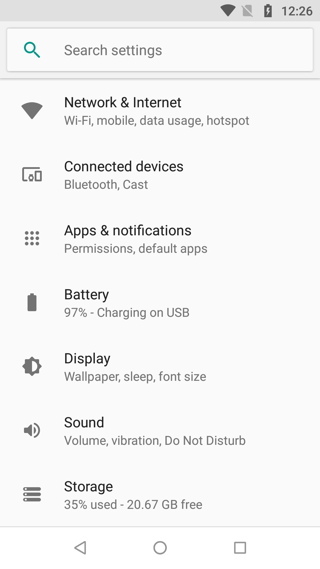 The firmware also comes with all the 8.1 Oreo goodies such as advanced Autofill for usernames and Passwords, advanced notification channels, new Emojis, smart text selection, etc. Plus, you get updated stock Moto apps. Here we have the full OTA update for the Moto G4/G4+ and the TWRP flashable zip as well. The OTA has been tested working on Moto G4 variants like XT1643, XT1642, XT1621. 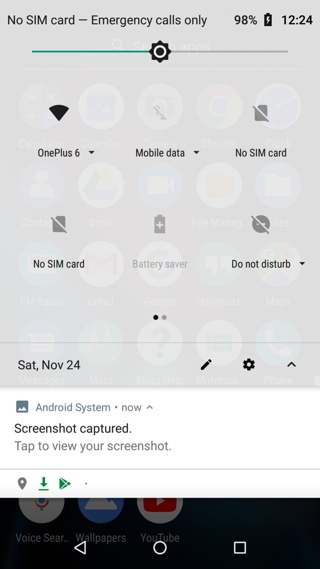 For other variants or models, it is recommended to use the TWRP backup listed in the downloads section or test the OTA at your own risk. So download and see how to install the latest Android 8.1 Oreo firmware update onto Moto G4 (Plus). 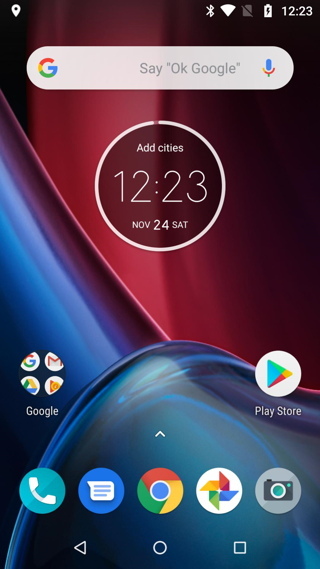 Following are the TWRP backup of the full stock firmware as well as the OTA updates for the Moto G4 (Plus) firmware with build number OPJ28.128. How to Install Android 8.1 Oreo for Moto G4 and G4 Plus via TWRP Backup? Make sure your Moto G5 (Plus) is rooted with latest TWRP recovery installed. Use recommended TWRP See how to install TWRP on Android devices. Download Android 8.1 Oreo TWRP backup from above. Extract the TWRP backup zip onto your PC. Reboot device into TWRP recovery mode. Take a full Nandroid backup including the EFS and make a copy of it on your PC. Copy the extracted TWRP backup folder from PC to your phone. Wipe Caches and Reboot to system. First boot may take some time upto 5-10 minutes. Note: You can also restore the TWRP backup using the restore option in TWRP recovery. Tap on the restore option. Navigate to the directory where you copied the files. Go to wipe , Wipe Dalvic cache , cache , data. How to Install Android 8.1 Oreo for Moto G4 and G4 Plus via OTA update? The easiest way to update your phone is via OTA upgrade. However, you will need to be on the stock ROM NPJS25.93-14-18 Android 7.0 with April 2018 Security Patch. However, note that this method will update partition table, bootloader of the phone, firmware, efs and modem partitions. So you may not be able to downgrade to Nougat if you don’t like this update. You may need to wait for the official Oreo stable or higher version of soak test to rollout, in order to update. Download the Moto G4 (Plus) OTA zip file from above. Download the Moto G4 (Plus) OTA update zip file from above. You can also install OTA using ADB sideload method listed here. Motorola is now rolling out official Android 8.1 Oreo OTA update for the Moto G5, G5 Plus and the Moto G5S and G5S Plus. The manufacturer is also sending out Android 9.0 Pie Beta email registration. You can sign up for Moto’s Soak test based on Android P from here for devices like Moto X4 and more.